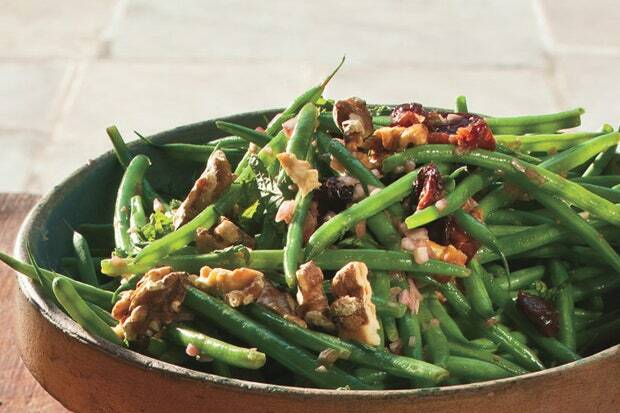 Treat your taste buds with a healthy Asian dish in this Chinese Long Beans with Sour Cherries and Aleppo Marash Pepper recipe. It's nutritious and tastes great! ﻿Wash the beans and place them in a crock pot with all of the remaining ingredients except the lemon juice. Cover the beans with a piece of crumbled parchment paper and set the lid on. Cook on low for 5-7 hours on high for 3 & 1/2 hours. Check the progress every hour and stir the beans gently to keep all of them moist and in contact with the oil and the water. When the beans are cooked, remove them from the cooker and drain the excess liquid. Place the beans in a bowl, cover, and refrigerate overnight. Let the beans come back to room temperature before serving. To finish the dish make the sauce. In a small mixing bowl, add the soy sauce, hoisin sauce, marmalade, sesame oil, rice vinegar and fresh ginger. Whisk the ingredients well. Add the sauce to the cherries and toss carefully. Add the sauce to the beans and adjust the salt and lemon juice if necessary. Toast the pecans over medium heat until fragrant. Be careful not to burn the nuts. Remove the nuts from the heat and chop finely. Add the nuts to the beans, put in a pretty bowl and serve.